You say Bananas- I say Bananas. Why is it? Sometimes the bananas get scarfed up, sometimes they are left to ripen? Well today I had very ripe bananas and on those days when there is a cool fall-ish summer breeze…. 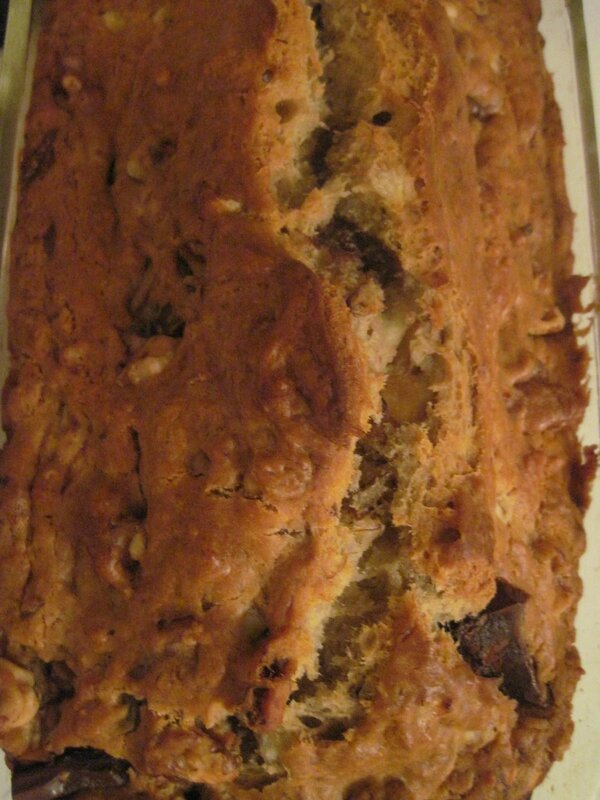 I hear the sound of the Banana fairies giggling for me to make banana bread with melting gooey chocolate, it is almost like a cake, but it is called bread. It’s delicious cake bread- not to be confused with my favorite wine and much cheaper…. Grease loaf pan, with shortening. Mix sugar, bananas, oil and eggs with a wooden spoon. Stir in remaining ingredients. Pour into pan. Bake until a wooden toothpick inserted in the center of the bread comes out clean, 60- 70 minutes. Let cool 10 minutes, then loosen sides of loaf pan and remove from pan. Let cool completely before slicing. Thank you R. Kirk Moore!